Yesterday I had to bid farewell to two friends who are leaving back to their home countries of Sweden and Holland. We met in Level 1 of Arabic classes at Fajr Centre for the Arabic Language. Our class started on the 14th of February this year. They both intended to stay here at least until they finish the 14-level course. But Allah SWT decided that their time here in Egypt is up. Life here in Egypt is not for everyone. And it is difficult if you have children and are studying. One of my friends felt as though she wasn’t giving her child his due right and she was struggling with her studies, and her husband couldn’t spend as much time as he wanted to on his studies because he had to spend more time with his wife and son than before. Mothers miss the support structures and social circles that they previously had. Many ladies have said that they wish they came here before they had children. During level 4, the institute moved location. It was a bit of an inconvenience because we had moved flats for me to be closer to the Arabic centre, and now I had to travel by Uber to class every day. After level 4, I decided to leave Fajr Centre to instead get a private tutor to focus on my speaking. It was really good and I improved, Alhamdulillah. However, I knew it was time to go back to a centre when I started feeling lethargic due to just being at home. So I did. I had to retake the entrance exam and was placed in level 5. I’m currently level 7. I’m really happy this level because I got my favourite teacher, Ustadha Yasmin, and my favourite time-slot: 11am!😁. And even better, the centre decided to open up another branch close to home, so tomorrow I get to walk to class again. The Arabic is finally getting exciting for me as it’s getting more challenging. We’re starting balāghah tomorrow. Studying Arabic in Cape Town gave me a good foundation to build on. We have a private Qur’an teacher who comes to us twice a week. We’ve had lots of breaks due to my husband’s exams and traveling etc. But I can’t blame that for my slow Qur’an progress. I really should have been finished with my Shu’bah khatm by now but I’m about half-way through it. I didn’t want to push myself and do it just for the sake of it. I really struggle with my Qur’an – not in terms of the actual recitation, but in being sincere. May Allah SWT grant me sincerity. Āmīn. 1. Ideally do it while you’re single or married without kids. It’s the best ever! 2. Study in your homeland or online before travelling abroad to save time abroad. 3. Financially prepare before you come and have back-up finance in place. You will need it at some point. I’ve reached the 20 juz mark and need to now recite it all out to my teacher, but I seem to have a block, which I believe to be self-sabotage, where I won’t allow myself to reach or go beyond a certain level of success. Funnily enough, I don’t fear failure, I fear success. So I looked up what to do about it and came across Marie Forleo. “…I learned about a concept called “upper limits” and the unfortunate link many of us have between self-sabotage and expanded success.” -Marie Forleo. For some people, when they reach their “upper limit”, defined as “the limit that you allow yourself to feel happy and successful”, they get sick, others want to run and hide. 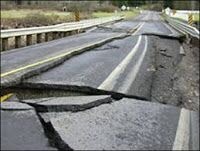 Some get themselves in accidents or they start dropping the ball at work. The upper limit is almost like an internal thermostat; like your success comfort zone. Apparently, each of us has a limited tolerance for feeling good. So when things go amazing and we go beyond that upper limit, many of us start to unconsciously sabotage ourselves so that we can get back to our comfort zone. Become aware of where you self-sabotage and pay extra attention when you start to do it. You’re going to face this throughout your entire life and the more awareness you bring, the more you reset that thermostat and re-calibrate yourself to handle success. I expand in success, love and creativity every day as I inspire others to do the same. Jenna – the Qur’an teacher! 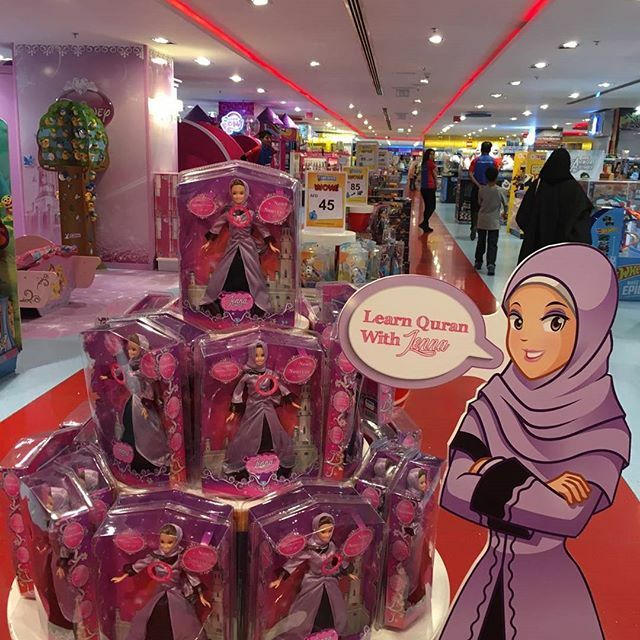 A doll that recites 4 surahs. It is really pricey, especially since the Rand is my currency, but I could not resist ordering one online. I pray that it gets delivered to me safely. “Why am I learning this Quran? The cliche answer is: for guidance. But what does that mean? “When we’re asking Allah for guidance, we’re asking Him for the strength to make the right choices. This book was published way back in 1979 and I am fortunate to be alive in a time where the opportunity to be an Islamic psychologist is not a far-fetched dream but a reality, Alhamdulillah. I hope to further my studies by doing Islamic psychology at the Islamic University of Malaysia in the future inShaAllah. I was so inspired by the profiles of the female lecturers there (which I read on their website). I have many aspirations and I make du’a that Allah SWT guides me to what will be most beneficial to His creation and be most pleasing to Him. Aameen. when I came across this on Islam Q & A and I couldn’t stop myself from sharing it. It is a reminder to myself first! Undoubtedly forgetfulness is something that is natural in man, and man is only called insaan because of his forgetfulness (nasiy). Usually this varies from one person to another, according to the differences in the strength of the memory that Allaah has created in His slaves. The Qur’aan “escapes” from the heart if the Muslim does not constantly and regularly review what he has memorized of it. The reason for this may be that it is a test of people’s hearts, to show the difference between the one whose heart is attached to the Qur’aan and regularly recites it, and the one whose heart is attached to it only whilst memorizing it, then he loses interest and forgets it. The reason may also be to give the Muslim a stronger motive to recite the Qur’aan more frequently so as to attain the immense reward for every letter that he recites. If it were the case that he could learn it and never forget it, he would not need to read it frequently and then he would miss out on the reward for reciting and reviewing it regularly. Fear of forgetting it will make you keen to recite it so as to gain more reward with your Lord. For every letter you recite you will have one hasanah, and the reward for one hasanah is ten like it. 1- The hadeeth narrated by al-Bukhaari from Ibn ‘Umar (may Allaah be pleased with him), that the Messenger of Allaah SAWS (peace and blessings of Allaah be upon him) said: “The likeness of the one who memorizes the Qur’aan is that of the owner of a hobbled camel. If he tends to it regularly, he will keep it, but if he lets it go, he will lose it.” (al-Bukhaari, 5031). It is well known that if a camel escapes and runs away, it cannot be recaptured except with a lot of stress and difficulty. Similarly, if the person who memorizes Qur’aan does not regularly review what he has memorized, he will lose it and will require a great deal of effort to get it back. * Al-Haafiz Ibn Hajar said in al-Fath (9/79), in his commentary on this hadeeth: so long as one constantly reviews it, what one has memorized will remain, as is the case with a camel, if it remains hobbled, you will keep it. The camel was singled out here because it is the most likely of domesticated animals to run away, and if it does run away, recapturing it is very difficult. 3 – Al-Bukhaari (may Allaah have mercy on him) narrated that ‘Abd-Allaah said: the Prophet SAWS (peace and blessings of Allaah be upon him) said: “It is not right for any one of you to say, ‘I have forgotten such and such.’ On the contrary, he has been made to forget. Try to review the Qur’aan, for it is more likely to escape from men’s hearts than camels.” (Saheeh al-Bukhaari, 5032). So whoever strives to memorize it and recite it regularly, it will be made easy for him, and whoever turns away from it, will lose it. This is what encourages us to constantly review what we have memorized and to keep on reciting it, lest we forget it. The Prophet SAWS (peace and blessings of Alalah be upon him) gave this example because it is the best way to explain what he meant. He also confirmed it with his oath ‘by the One in Whose hand is the soul of Muhammad’, to affirm the importance of constantly reciting the Qur’aan and reviewing what one has learned. 3 – With regard to the report that Anas ibn Maalik (may Allaah be pleased with him) said: the Messenger of Allaah SAWS (peace and blessings of Alalah be upon him) said: “The sins of my ummah were shown to me and there is no sin greater than that of a man who was given or was helped to memorize a soorah or an aayah of the Qur’aan and then he forgot it.” This is a weak (da’eef) hadeeth which was classed as such by al-Bukhaari and al-Tirmidhi. See Takhreej Mishkaat al-Masaabeeh by al-Albaani, no. 720. The Salaf were always afraid of forgetting Qur’aan after they had memorized it, because this was a shortcoming. One of the best ways to help oneself to remember what one has memorized and to make it firmly-entrenched is to recite it in one’s salaah, especially in Qiyaam al-Layl. The Salaf used to recite it during the day and when praying Qiyaam al-Layl. If you strive heard to review the Qur’aan regularly, there will be no sin on you even if you do forget some of it. The blame is on those who neglect it and fail to review it and read it regularly. We ask Allaah to forgive us. O Allaah, make the Qur’aan the life of my heart, the light of my breast, a departure for my sorrow and a release for my anxiety. O Allaah, teach us from it that which we do not know and remind us from it of that which we have forgotten, for You are the All-Hearing, All-Knowing. Update on my hifdh journey: we had a mock tamat (graduation) last week and oh my, it went terrrrrible. I was anxious to the max. I’m not usually nervous for anything, I’ve bunjee-jumped for goodness’ sake! But when it came to the Qur’an, I just couldn’t deal. I think it had a lot to do with not being able to let go and not trusting Allah that the aayaat will flow from me. So I phoned my unofficial hifdh mentor for some advice. The first thing she stated was: you don’t have control; get over it. She said anxiety is from Shaytaan, and it’s not simply mind over matter – he actually runs in your blood, so seek refuge from him. She said Shaytaan is going to be so angry on the day of your tamat (’cause it means he lost). She told me that Allah has big plans for my life, and I can do this. Everything she said motivated me, Alhamdulillah. On the school front, my ustadh’s strategy has been to test me on 5 ajzaa every day. I’ve been tested on my first fifteen ajzaa so far and it’s been going okay, Alhamdullilah. He feels a bit relieved. The tamat is an emotional occasion for him too. He said he feels like he’s going to be giving us over to a new life [the way a father gives his daughter away on her wedding]. He’s been a father to me especially. I’ll never forgot the things he’s done for me that made me feel like a cherished daughter, like pulling over to speak to me when he was driving at night, answering my call during his dont-talk-me-I’m watching soccer match and sincerely listening to me complain about my hifdh, every single time (astaghfirullah). He’s seen me cry more times than my parents have (in my adult life). I feel that Allah took away my biological father but finally replaced him with better, Alhamdulillah. Back to my hifdh update: We’re having another mock tamat (graduation) tomorrow in-sha-Allah, but only on the first fifteen ajzaa. I’m not done revising yet and it doesn’t help that I’m assisting with a bridal shower tomorrow, that I’m excited about. I also have gifts to prepare for my teachers and parents. I’m totally going to share pics of them with you after the tamat ’cause I’m pretty chuffed with what I got. Except that I have no idea what to get my mother. I don’t have a budget so I’m searching the internet for ideas for freebies. I can’t comprehend that I only have a week left of hifdh school. I just can’t. I felt the same way at the end of Matric (Grade 12). When I finished Matric, I said I didn’t want to experience it again, but my hifdh journey was like going through Matric all over again, Alhamdulillah. I’ve come to accept that Allah chose my school and my teachers for a reason. I just wish I came to accept it a looong time ago. I wish I was grateful. I wish I trusted Allah (s.w.t.) more. I wish I worked harder. How I wish. 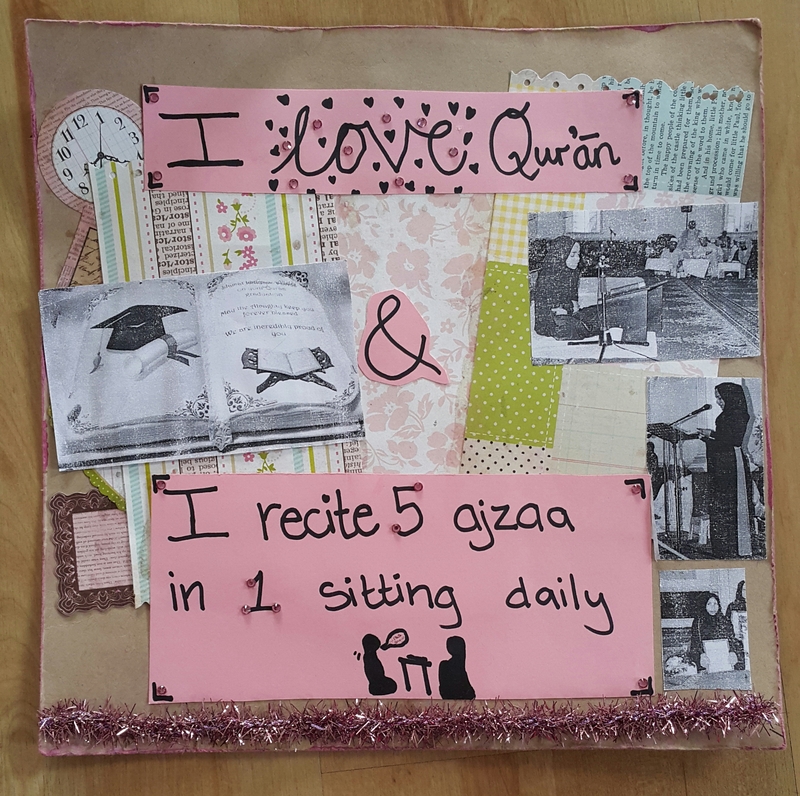 Blog post #3 on Innovative Ways to Memorise the Qur’an. Sheikh Dr. Yayha al-Ghawthany said that the following steps are of utmost importance. They are the most solid thing we learned at his workshop. He said that he discovered this through the mercy of Allah over a number of years and he has tested it on hundreds of people with amazing results. My personal recommendation: Only attempt this method when you are prepared to memorise; once you can read the page fluently with no mistakes. Be sure to sit up straight. Hold the Qur’an high [eye-level] and to your left. Look at the ayah [or piece you intend to memorise]. Focus. Join the second ayah to the first. [Repeat above steps]. Note: If you are left-handed, you should hold the Qur’an to your right. This has to do with the way your brain works. I recommend that in step 3 you read the ayah many times, until it sticks, and in step 4, also repeat it from memory many times.